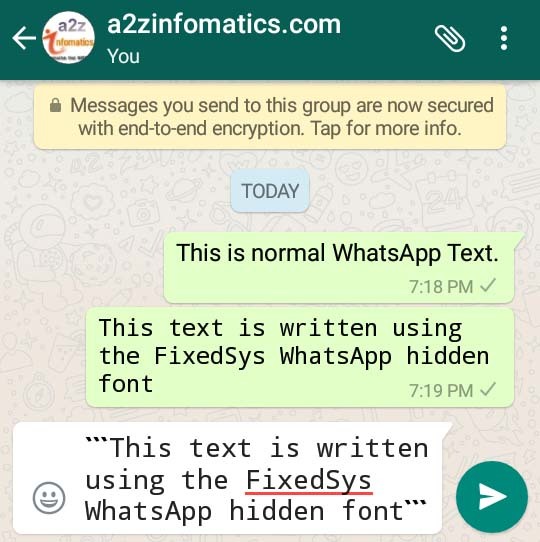 As revealed in our previous post that the WhatsApp people are always keen to add new features to their messaging app, this time they had added a new hidden FixedSys font. This new FixedSys font has been spotted in their latest Android beta build version, which can be downloaded from the Google Play Store. Some iOS beta users also reported that they are able to use this FixedSys WhatsApp font on their iOS devices. 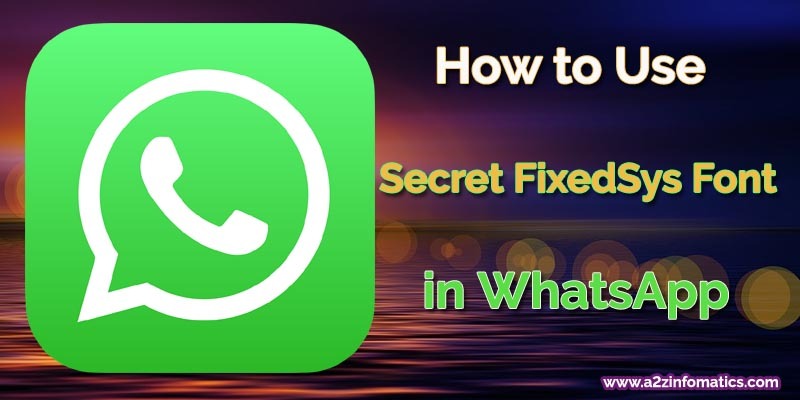 How to Use FixedSys font in WhatsApp Messages – Hidden Secret Revealed. This FixedSys WhatsApp font is very similar to the font, which Microsoft has used in so many of their Windows applications such as Notepad. Actually, this is the only custom font option available for the WhatsApp users at present. The implementation of this new FixedSys WhatsApp font isn’t very realistic to use. If anybody wants to type the message using this hidden FixedSys font, the user has to put three back quotes (left quote) before and after to the word or a sentence, each and every time for every single message. How to change WhatsApp font – WhatsApp status in Stylish fonts – WhatsApp font Trick – FiexedSys font in WhatsApp. For easy understandings, If anybody wish to type – Hello Dear, How’s life going at your part of the planet – using the new FixedSys WhatsApp font, then the user needs to put the whole sentence between the 3 back / left quotes (`) on both the ends. The typed text / messages between the 3 back quote (`) on both ends, will instantly modify its font to the new hidden FixedSys WhatsApp font. To tell you the truth, using FixedSys font frequently in the conversations is little bit complicated. In addition, if you wish to use the FixedSys font, you won’t be able to use WhatsApp Bold, Italic and StrikeThrough Text formatting features for your text or messages. 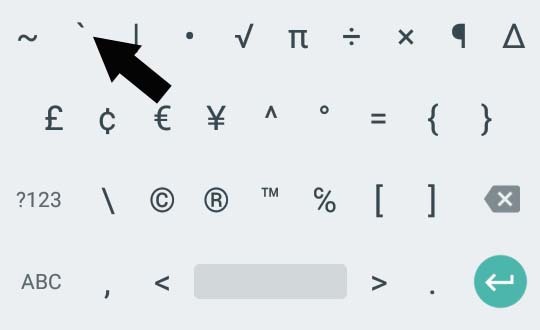 Important: iPhone users may struggle to find the symbol / character (`) on their default iOS KeyPad. To use the FixedSys WhatsApp font, you have to download any third party KeyPad / Keyboard from the respective App Store. 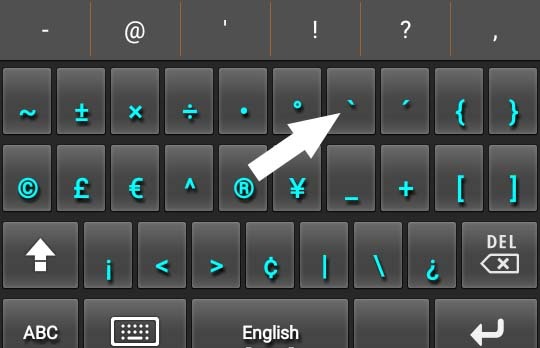 Where is back / left quote on KeyPad / Keyboard to use Whatsapp hidden FixedSys Font. WhatsApp FixedSys back / left quote position on Default Google KeyPad in Android. Recently, A lot of new features has been introduced into the WhatsApp to make its framework more user friendly and entertaining. WhatsApp quote message feature is one of them, which gives an option to the user to quote any specific text, media or message and answer back to them. Reports indicates that the Facebook owned WhatsApp is likely to add GIF support for their iOS app users. Earlier, the WhatsApp Developers has added the support to share PDF and Doc / Docx files, the Video Calling feature etc. The WhatsApp Video calling feature has been appreciated by the majority of the WhatsApp community. On the other hand, they are working 24*7 to improve the security of user privacy. The data transmitted onto the WhatsApp network is now fully encrypted, nobody can listen or read any of your conversation on the WhatsApp network. WhatsApp has the history of gently and cautiously adding new features to their messaging app. Keep the finger crossed, who knows which new feature will be spotted in WhatsApp in coming days. That’s all from now, Please do share your suggestions to improve this blog or this particular piece of information about the FixedSys WhatsApp font. Thanks for your time, love yourself and keep good care of yourself. We will be back with more informative stuff SHORTLY.